Is there anybody else out there who has had a child criminalised or imprisoned for a drug offence and feels that it was cruel and unjust? Is there anyone who knows that their child’s life was changed or blighted unnecessarily, and will stick their neck out and say so, to try to end this cruel practice? I don’t want to be writing this. Or more accurately, it’s shocking that I should need to. But nothing has changed. We’ve been fighting for over twenty years and nothing has changed: the punishments for drug offences are exactly the same, while the harm they do mounts. I write this as a begging blog that hopefully may begin to turn the tide, but I need your help. Is there anybody else out there who has had a child criminalised or imprisoned for a drug offence and feels that it was cruel and unjust? Is there anyone who knows that their child’s life was changed or blighted unnecessarily, and will stick their neck out and say so, to try to end this cruel practice? There are thousands given criminal records and locked up every year because of UK’s drug laws so I can’t believe that my husband and I are the only parents who think this is wrong and are willing to stand up and speak out. If this silence ends, maybe we won’t have to wait another twenty years to protect so many precious futures. Every parent must accept that their children will do things that they don’t want them to do. In the case of drugs, because they are illegal, things get more complicated. 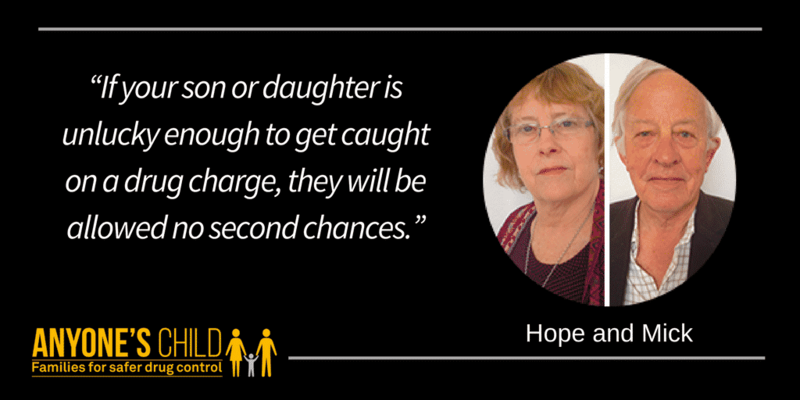 No one wants their children to be in trouble with the law, but what if the law itself is flawed? Laws can and do get changed if they are not fit for purpose and do more harm than good. Look at the laws against abortion and being gay. Even a cursory glance at UK’s Drug Laws shows that, not only do they ignore science, evidence and humanity, but they have made drugs even more dangerous by leaving their supply in the hands of those only out to make money. The Law has been unable to stop drugs because it is an impossible task. However many billions of pounds they waste trying, evidence proves how badly they have failed and will continue to fail. One of the most frustrating things is trying to find something constructive to do that might help to get change, so great when the perfect opportunity turns up. The 26th of June is the UN International Day against Drug Abuse and Illicit Trafficking. 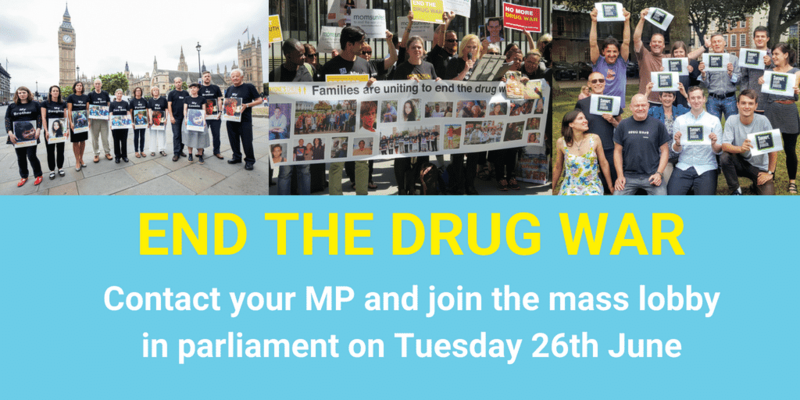 Transform and Anyone’s Child are joining with Support Don’t Punish in London to demonstrate to MPs and the media that there is huge support for drug policy reform, that the time is right. We hope that some of you reading this will want to support us by coming to London and standing beside us. You would have to lead a very sheltered life, not to know that most young people will try illegal drugs: your sons and your daughters. Unfortunately, the present set-up makes this much more perilous than it needs to be. Some of the most dangerous drugs like alcohol and tobacco are legal but controlled, while other less dangerous ones, like cannabis and ecstasy, are illegal but totally out of control. Ecstasy, if controlled and regulated, is, as a well-known psychopharmacologist once said, safer than horse riding. Few would want to ban riding but do approve of safety helmets and reinforced vests to protect riders. People whose children have died because of drugs, have experienced the worst thing ever. They have lost their beloved child and have little left to lose by speaking out to try to stop the same thing happening to others. It can be more difficult for those whose children are still here, struggling with their lives, because of the illegality of drugs and the terrible punishments meted out. But if parents like us keep quiet, it’s like condoning what happened, like aiding and abetting it to continue. The hypocrisy, ignorance and stigma surrounding drug use seems overwhelming, but we must look at the truth beyond. Nice people use drugs. Intelligent people use drugs. Your son or your daughter probably use drugs. But the law does it’s best to harm them by forcing them to get unregulated, often contaminated, drugs. Or it crushes them with a criminal record, even a prison sentence, if they are unlucky enough to get caught. Our son was at Manchester Uni and no better or worse than any other student. He and his adult friends enjoyed smoking cannabis and taking ecstasy when they went clubbing. Almost everyone who uses drugs shares them or takes a turn to get them. He was caught taking his turn and told the truth straight away, but honesty proved to be far more dangerous to him than the drugs he was experimenting with. He was sentenced to prison for two and a half years, starting in Strangeways. I won’t go into how terrible that all was and how damaging and persistent the consequences, but what I will say is, that it is undeniable that the drug laws destroy more lives than drugs do. They are so indiscriminate that they cannot differentiate between professional drug dealers and hapless youth. We were very lucky that Manchester Uni, unlike the law, and many other universities, could tell the difference. They didn’t expel our son. Not only did they allow him back after prison, but he went on to achieve a Master’s in science. But the stigma of prison and a criminal record stopped his scientific career in its tracks, maybe forever. Anyone's Child: Hope's Story (subtitles) from Moore Lavan Films on Vimeo. Most campaigners at Anyone’s Child are those who have lost children, husbands or partners, and they are doing everything they can to get the law changed so help is put before punishment, and no one need die from unregulated drugs. They know, in the most tragic way possible, that it is too late to protect the dead. As far as I know, my husband and I are lone voices speaking up for those, who because of UK’s drug laws, have their futures altered and limited for as long as they live. Young people who have done something that is more adventurous, than wrong, and more dangerous than it needs to be, are treated brutally. Please try to help us end this persecution of bright experimental youth. “Your sons and your daughters are beyond your command” but you have the power to keep them safer. In many places around the world there have been positive changes. Portugal decriminalisedpersonal use of all drugs fourteen years ago. The young are not given criminals records or locked up for using or sharing drugs. Deaths from overdose have plummeted. In the UK it increases annually. Switzerland has had heroin assisted treatment for years so no one has to steal to get it. Not only has crime dropped, but many users stabilise and live and work instead of using and dying on the streets. In the UK, OD deaths and drug related crime are rocketing. Many states in the US have legalised cannabis for recreational use and even more allow medicinal use. There has been a drop in alcohol problems and less use of more dangerous drugs. Sales of cannabis have been taxed, and the money raised, used for health and education, instead of punishment and prison. UK is lagging behind in every way and it’s our families which take the brunt of this blinkered approach. 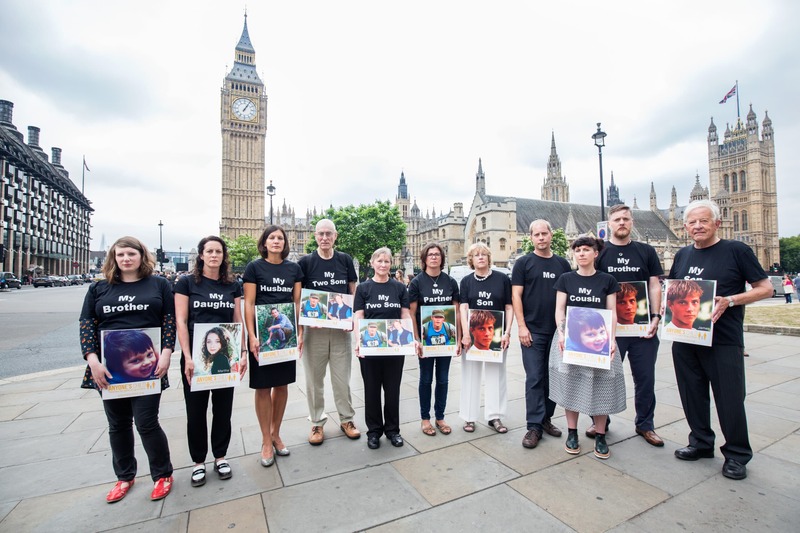 As I said at the beginning, this is begging blog, and I’m begging you to get in touch with Anyone’s Child if you are willing and able to fight for change in UK’s cruel, irrational and arbitrary drug laws. I know I can’t be alone. Please tell me we are not alone, not the only parents who will never accept that their son/daughter is bad or a criminal: who know that this is not justice or truth. June 26th is getting very close now. Campaigners from Anyone’s Child have been contacting their MPs and will be up in Parliament to talk to as many of them who will listen. The media will be there. The tide is definitely turning. MPs from all parties are supporting us now but we will need many more to get change. Can you come? Can you write to your MP? Can you help? If you contact Anyone’s Child they will send you a recommended draft text for your letter and give you any assistance you need. Click here for more information about June 26th. There is strength in numbers and by supporting each other and fighting together we WILL get reform. Contact Anyone’s Child. We can’t wait to hear from you. Having already waited for over twenty years we desperately want to live to see to see change happen. You can make it happen!